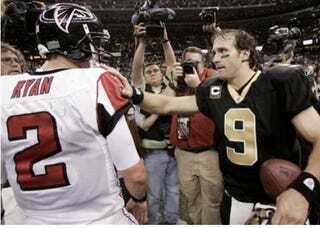 The Falcons can clinch the Dirty South with a win tonight, but the Saints will try to remind America they still have a good football team in 2010, too. It's the battle for Trent Dilfer's soul! So talk about it in the thread down below and keep yourselves company. Tomorrow we should be back to a fully-staffed website when everyone returns from holiday slogging. Thanks for your continued support of Deadspin. Thundersnow.